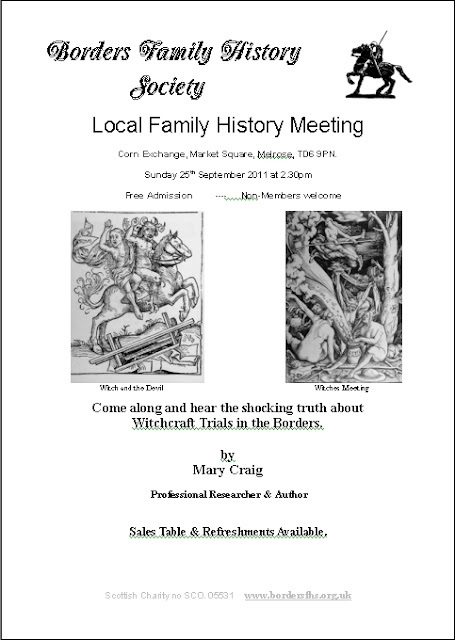 Our first talk of the 2011/2012 season is on Sunday 25 September at 2.30pm at the Corn Exchange, Market Square, Melrose, TD6 9PN. Map. Mary Craig is the author of Border Burnings and she will be telling us about the witch trials of the Borders. Her talk will outline the trial, torture and execution of hundreds of innocent people, (mainly women) in the Scottish Borders during the 17th Century at hands of the Church of Scotland and the local judiciary. Between 1600 and 1700, more witches were accused, tried and executed in the Scottish Borders than any other area of Scotland except Edinburgh and the Lothians. Speakers at Society meetings occasionally need to be changed at the last minute, due to circumstances beyond our control. Where possible, updates will be made on our What's On page. You missed a brilliant talk, Mary really made the subject come alive.She talked about the background to the issues, the kinds of evidence, accusations, the pre-trial investigations and tortures, the trial procedure, and what happened afterwards. Unfortunately the book is out of print, however she expects that it will be reprinted this year, and we will be selling copies. So, sign up to the RSS feed, http://feeds.feedburner.com/BordersFamilyHistorySociety, and we'll blog it when it becomes available.